Observational studies of the efficacy and safety of tyrosine kinase inhibitor (TKI) treatment in patients with chronic myeloid leukemia (CML) who did not participate in clinical trials are scarce. 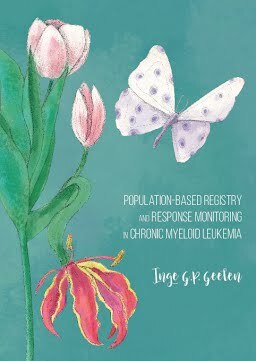 This thesis describes the characteristics and outcome of patients included in the Dutch population-based CML registry (PHAROS, Population-based HAematological Registry for Observational Studies). It starts with a practical guide on cytogenetic and molecular variants and abnormalities in CML treatment. Our population-based evaluation of (deep) response rates to first and subsequent treatment lines confirmed that the long-term outcome of patients treated with TKIs is excellent, also in the ‘real-world’ setting. Furthermore, a validation study combining data from both the Dutch and Swedish population-based CML registry demonstrated that the novel EUTOS long-term survival (ELTS) score performed better than earlier risk scores (Sokal, Hasford and EUTOS) on predicting both molecular and survival endpoints. Suboptimal monitoring of response to TKI treatment was observed in a quarter of the patients. Moreover, inadequate monitoring was associated with a reduced overall survival and hospital CML treatment experience was the strongest predictor for proper monitoring. Evaluation of all simultaneously performed cytogenetic and molecular response assessments in the registry led to the conclusion that it is safe to omit routine cytogenetics for response assessment. Finally, the thesis reports the results of a phase II, single arm, multicenter trial (NordDutchCML009) demonstrating that switching from imatinib to nilotinib with the addition of pegylated interferon improves the depth of molecular remission when this was not achieved on imatinib before, but is not a feasible treatment strategy due to excessive toxicity.